When we booked our rooms for Florence, way back in October, we made the classic beginner’s mistake of misreading the dates and booking one night too few. Thankfully, we realized this early on, so it didn’t catch us by surprise. 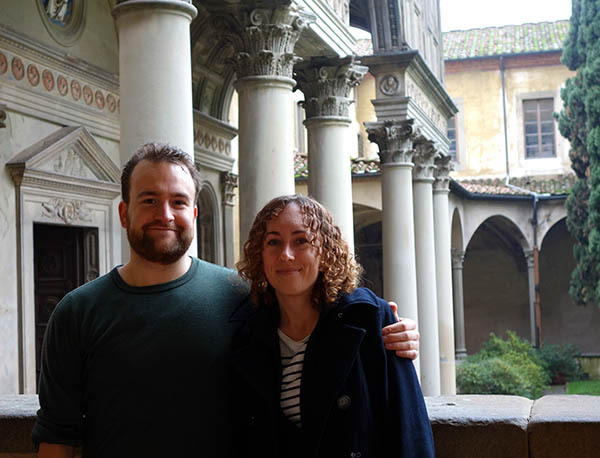 We’d put an unscheduled day between Florence and Rome, at some undecided location (so as not to plan out every single day of the trip – we could go somewhere that caught our fancy). Now we had two nights to play with. 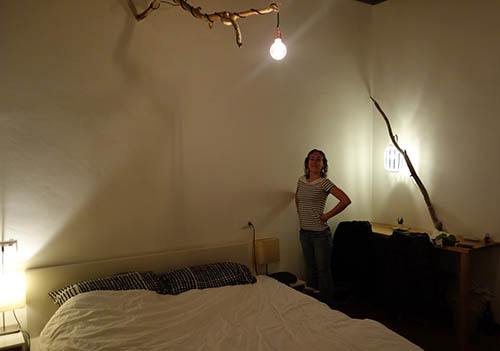 Personally I was pretty happy about this – I didn’t get much sleep in Florence next to the highway in our noisy room. And I think we’d both agree that it worked out well, because Lucca turned out to be our favorite city in Italy. Before we headed there, though, we had a half day left in Florence. What to do? How about two churches and a museum? And getting a nice view of the city? Leaving our apartment, we headed east, towards the tourist district, but we stayed on the south side of the Arno, away from the crowds. It was cool, with mist so thick it felt like rain, and it took until midday for the mist to rise, so we hiked up the hill to Piazzale Michelangelo in the fog. The steps were steep and took us through a small, charming park. This was favorite area of the city – the far southeast corner. It almost felt suburban, or maybe like the hills of San Francisco. 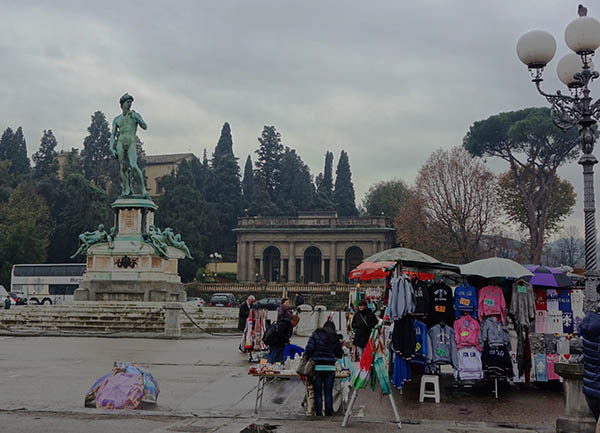 The Piazza is renowned for its view, but the weather shrouded much of the city’s charm. If we stayed another day, this would have been a great place to take in the sunset. The Piazza commemorates Michelangelo, and is dominated by another replica of the David, this time in bronze. This was the second full-size replica of the David we’d seen – and that’s not to mention the vendors with hundreds of tiny David tchotchkes. Heading back down to city-level, we crossed over the river and visited Santa Croce. This large, but relatively nondescript church is known as the burial place of Michelangelo, Machiavelli, and Galileo (at least, most of him). 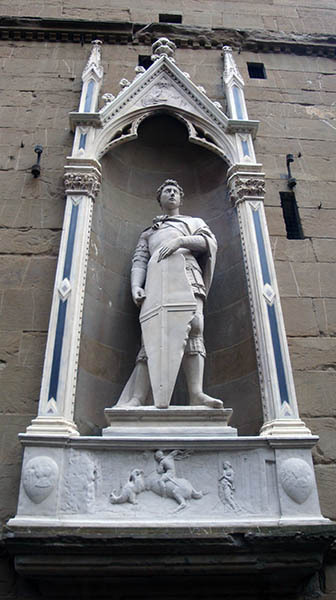 It also abuts the Pazzi Chapel. This chapel is reputed to be the most pure work of Renaissance architecture, as it was unaltered by later architects. To be frank, we were a bit ‘churched-out’ at this point. The Pazzi Chapel, for instance, is nice enough, but it feels like one of those milestone works of art that inspired hundreds of imitators – so it’s difficult for the layman to understand it’s beauty and originality. At least, that was my impression. It felt a bit like the monuments in DC, or maybe the interior of Grant’s tomb. The chapel, church and adjacent walls enclosed a peaceful cloister area that was my favorite part of the church complex. This was impressive, but I really don’t what it is! 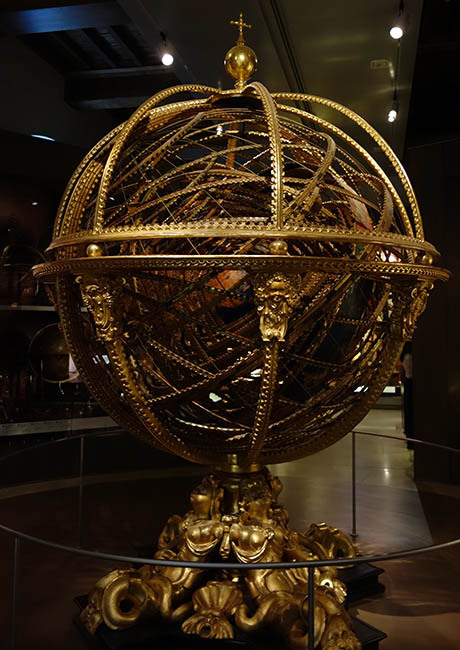 Deciding to take a break from all the artwork we’d seen, we instead decided our next museum would be devoted to scientific instruments: the Galileo museum. If you like brass and chrome, this is the museum for you, because just about everything was shiny brass or silver. I think it would be paradise for the dedicated historian of science. As it was, it was pretty difficult to understand the functionality of 18th-century scientific instruments. But the museum is still notable for a few things. To start with, I really enjoyed taking a close-up look at the Fra Mauro map – we’d seen the original in Venice. There were also some incredible globes, of both the earth and the sky. 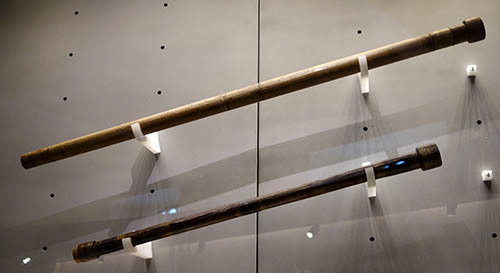 But my favorite was seeing Galileo’s actual telescopes: the very telescopes used to observe sunspots and Jupiter. This was an amazing treat. After all, the observation of sunspots was a huge change in how the universe was pictured – the sun was hardly some pure object anymore. Not to mention that Galileo’s work on sunspots influence even how we think about effectively conveying information. And then, of course, there’s seeing Jupiter for the first time! There were also two copies of Galileo’s books: Recens Habitae and Le Operazioni del Compasso Geometrico et Militare. But that’s not all. You see, after Galileo died, they didn’t know what to do with his body. He was a heretic, after all. 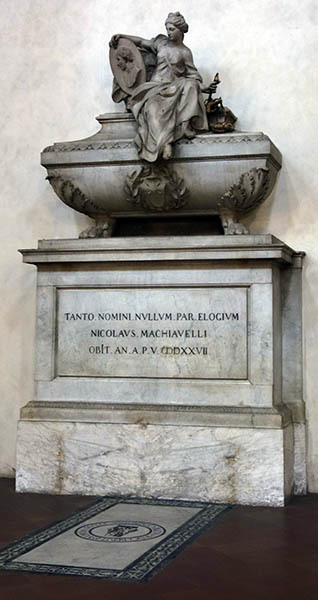 It was buried initially in a small Medici chapel in Santa Croce (the same church we’d just visited). 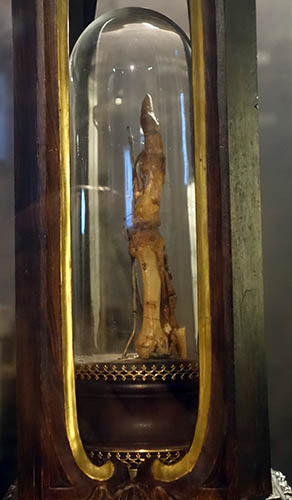 One hundred years later, his body was reburied in the main basilica of Santa Croce… but during the move, three fingers and a tooth were removed, put in jars, and preserved. And now you can see them in the Museo Galileo. Our final visit of the day, before heading to Lucca, was the Orsanmichele church, right near the main squares (we also took a final look at some of the big sights in good daylight). This church is surrounded by statues of the great saints, done by famous Renaissance artists such as Donatello or Ghiberti. And nearby are the Duomo and other Renaissance architectural marvels. But step inside, and you’re transported back into the middle ages: a small, dark room, with a huge altarpiece. This church, which is two stories, started out as a grain storage facility and market. Embedded in the columns, you can still see chutes that delivered grain from above. I really liked this church, small though it was. It felt more authentic, and more sacred somehow, than many of the larger cathedrals and basilicas that we’d visited. Now, finally exhausted and just about fed up with churches, we turned to the unknown: Lucca. This entry was posted in Italy on January 24, 2015 by rob.